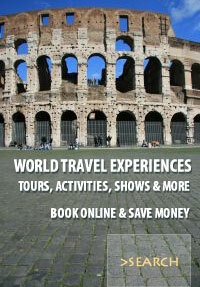 Book world Tours, Activities, Shows, Excursions online. Holiday activities from the world’s leading site for travel experiences. Tours, Activities, Shows, Excursions and more from the world’s leading site for travel experiences. Book before you go and save! Secure online bookings and guaranteed lowest prices. Online bookings are 100% secured by Verisign and certified Hacker safe by McAfee. Lowest price guarantee ensures that you will always get the lowest cost, highest quality experiences. Lowest price guarantee, reliable suppliers and activities are handled and organised by a leading bonded travel company - Isango. Europe holiday tours and activities. Activities and tours in Canada and United States of America. Featured countries: China, Hong Kong and Japan. Featured countries: Australia, New Zealand, Fiji. Namibia, Tanzania and South Africa - things to do when you get there. Including tours and holiday activities in Jordan and the United Arab Emirates.